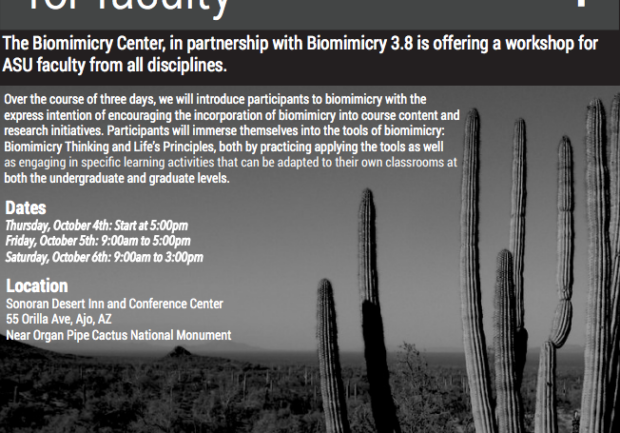 Over the course of three days, learn about biomimicry and how to incorporate it into course content and research initiatives. Immerse yourself in the tools of biomimicry through practice and application and engage in learning activities. Contact Val Reyes at olaya.reyes@asu.edu for questions about registration, or Dayna Baumeister, co-director, at dayna.baumeister@asu.edu for questions about the workshop. 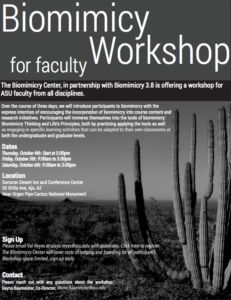 This is brought to ASU faculty by the Biomimicry Center, in partnership with Biomimicry 3.8. The Biomimicry Center will cover the costs of lodging for all participants.